We are on the cusp of seeing the beast of a camera coupled with Windows Phone hit the streets and with that new genre of devices (you know the super-crowded segment of 40+MP camera devices) comes a new genre of tones. Of course it would not be a Nokia without the ubiquitous Nokia tune. 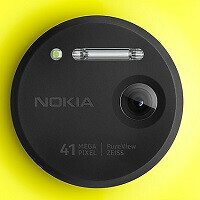 The Lumia 1020 gets a revised tune to hail its arrival. It is subtly different and instantly recognizable. Just like all the other variations of the tone that have been produced over the years, we are sure this new one will not please everyone. There is a new tone for messages which is very unobtrusive. Finally, we have a new alarm clock tone as well which is definitely not designed for those that are not easily awoken, but it definitely has a nice modern flair to it. If you want hear more of the sounds around all of Nokia’s image, there are dozens (and hours) of tracks to listen to by clicking on the source link. If you ask people that don't like Windows Phone, they'll tell you that you're not only stuck with that alarm tone, but it won't matter because there isn't a clock app for WP because the Store is a barren wasteland of nothingness. ... ... ...of course you can change the tones. We're just sharing the new defaults that Nokia composed for the 1020. Come on, just use Justin Bieber's songs as your alarm tone and you will never fail to wake up on time. Heck, it might resuscitate a patient in coma as well because he will get up to turn off the music. More than 20 years and Nokia still preserving this legendary tone. How great is Nokia !. I adore this company, and I'm still using Nokia tune on my Galaxy S3 & Iphone 5. Damn, I hate Stephan Flop !! If Nokia made an android flagship there sales would easily quadruple. I'm not really sure if I'd agree with that excuse. It's more of they want to stick with Windows because of Elop's connection to Microsoft. They're getting Microsoft's backing and they feel more secure with it. I really think they'd sell more if they produce Android devices. Using the new Nokia tone on my 920,sounds great.